©2007, 2008 Gary Taubes (P)2011 Blackstone Audio, Inc.
Gary Taubes takes the time to thoroughly review the scientific studies that medicine and nutrition science stand upon. What he finds turns the science upside down and shook my faith in research. Yes. It is a life-altering listen. The book is quite large, and this is the reason I decided to purchase the audio book. I would recommend this to a friend as it explains in detail about scientific nutritional information that affects not only the individual reading/listening but everyone on this planet. What other book might you compare Good Calories, Bad Calories to and why? Why We Get Fat is a condensed version of GCBC. However, GCBC expands on that information and gives even more credence to the carbohydrate hypothesis claim. It also expands on the notion that the diseases of civilization all stem from diet, specifically in direct causal relationship to dietary carbohydrate intake. His tone keeps the listener interested throughout. This is extremely tough to do when detailing scientific studies and nutritional science. Yes. The fact that heart attacks, type II diabetes, stroke, high blood pressure, gout, obesity and much more can be prevented solely by changing diet. The huge amount of evidence suggests the carbohydrate hypothesis is on the right track.Furthermore, other major unscientific claims are debunked:1)Cholesterol is a GOOD thing.2)Saturated fat is one of the most important nutrients you can ever ingest and should never be limited.3)Salt should not be limited.4)Exercise is not good for losing weight and can in fact have the opposite affect.5)Limiting food intake is not a good method for losing weight.Other interesting points the book makes:1)A lot of cause for infertility may be due to diet.2)Insulin resistance and future weight issues are determined in the womb.3)Nicotine affects fatty acid flow from the adipose tissue, which in essence is the hunger depressant associated with use. Once individuals quit smoking, they typically gain weight due to the re-regulation of fatty acid flow.4)A large portion of cancers are potentially due to diet alone. Therefore, they can be prevented. 5)It is hypothesized that rather than being a behavioral issue, anorexia and other eating disorders may be more biological than anything else. This book is a fantastic compilation of nutrition and metabolism research over the past century. Many studies are cited and described for the layperson as well as for the scientifically minded. Let me begin as stating that I went into this as being very skeptical, and even being on the side of our current dogma (low fat, low calorie as a healthy diet). As a scientist, I was looking for a book that would describe the science behind the idea of carbohydrate restriction, and this book is it. While it's important to note that the hypothesis of carbohydrates causing many of the "diseases of civilization" including heart disease, obesity, and cancer, is not scientifically proven without a doubt, this book opened my eyes to the fact that dietary fat and cholesterol as a cause is ALSO not proven without a doubt. As a scientist in immunology, I find it appalling that the obesity and nutrition research field has gone down this path of biased interpretation. I understand it is frowned upon to challenge conventional wisdom, but when this dogma is so poorly supported, there should be someone out there to challenge it! Based on what the author has laid out, these two competing hypotheses on nutrition (low fat/calorie restriction vs. carbohydrate restriction) should have academic and industrial researchers on BOTH sides working on studies that can definitively support either one. My hope is that this book has woken up this field to really test this alternative hypothesis of carbohydrates (via insulin) as the cause of our obesity epidemic. Currently, the United States government is recommending to the public to semi-starve themselves and eat a higher percentage of carbohydrates in their "healthy balanced" diet. If this is wrong, think about how many lives were lost and how many diseases could have been prevented, not to mention the ridiculous burden on healthcare to treat all of these diseases. In addition, it would be nice to turn around the public perception of overweight and obese people being gluttons and sloths. In addition to the science, the history of how we got to where we are was fascinating. The role of WW2 on this science alone is something people really do not think about. Lastly, the audio was also very good. The reader changes his voice when he is quoting something to the point where I could tell when quotation marks were present in the book without actually seeing the print! Overall, this was very well done. In summary, I highly recommend this book. Personally, my wife and I have switched to a low-carb lifestyle recently, and even after three weeks, we feel great. We're not nearly as hungry as on our prior calorie-restricted diets, and we've already lost 10lbs each. The author's description on how the diet works really has motivated me to stick with it. Additionally, with my family history of heart disease and obesity, I hope to curtail any risk by sticking to this new dietary regiment. My hope is that these hypotheses are eventually tested in an appropriate scientific environment and then interpreted in an unbiased way. Finally, once the science is there, the public health machinery really needs to ramp up its efforts to turn this obesity epidemic around. This changed the way I look at food! The information in this book was completely new to me. The things that we take for granted about food are not true (or at least unproven). This book was an exhaustive look at food and health, in particular the diseases of civilization. Very interesting stuff, but it is exhausting to listen to. The amount I learned made up for the excessive explanation and evidence... On the other hand i am not sure I would have been convinced with less evidence. Science, science, and more (fascinating) science. There are two versions, one written with all the science (this one) and one written with just the principles laid out. I was afraid this longer version might be dry, but he draws all the scientific studies before in a masterful explanation. I was looking forward to the conclusions but sorry when it was over. What made the experience of listening to Good Calories, Bad Calories the most enjoyable? 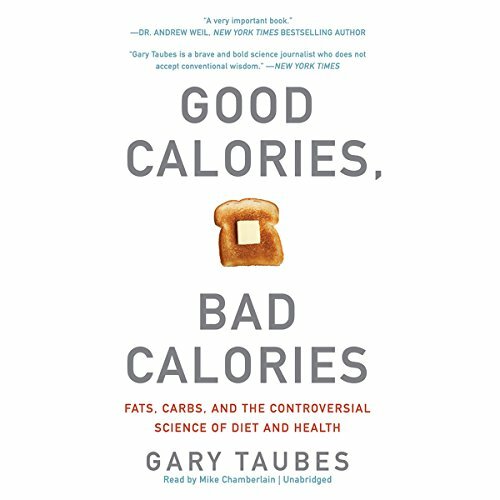 Gary Taubes opens up a controversial subject, but backs up his arguments with extraordinarily interesting research. I have not read another book like it... the closest I can think of is Jonathan Bailor's "Smarter Science of Slim". The experiment where Steffanson (sp?) eats only meat for a year, while all of his labs and bodily functions are analyzed. It inspired me to try out the low carb lifestyle, which has resulted in the best blood glucose control of my life (I have type 1 diabetes). Even if you don't agree or have any interest in low carb diets, this book is absolutely fascinating. I'm usually quite skeptical of fad diets and the like, but Taubes focuses predominantly on peer-reviewed, well-planned research studies. He also interviews numerous people with various science backgrounds to form an extremely persuasive argument. Would you consider the audio edition of Good Calories, Bad Calories to be better than the print version? Yes, because it is very long and I doubt I would have finished it if I was reading it. I don't know of anther book that gives an exhaustive study of diet research. May me change the way I eat. A must listen for anyone with weight problems who thinks the way to lose way is to cut calories. Good, though tough to get through. There really isn't a better resource out there for all the science that supports low carb way of life. The problem is that when you put all that science in to one book, that book becomes quite a task. It took me a few months to get through it in audio format, it probably would have taken a year to get through in hard copy. That being said, it's still the best book to learn all you want to learn about overweight and health and micronutrients and how you can't trust the food pyramid in your decision making process in regards to your nutrition. What did you love best about Good Calories, Bad Calories? Extremely well researched book. It took 5 years to write and it shows. Debunks the diet myths. Killer focus on carbs and insulin as the culprit. Backup with historical and demographic and anthropological data. The science of fat metabolism is clarified. the compilation of sugar as the culprit is extensive. Long precise and detailed. A must read for anyone who plans to eat for the foreseeable future. What was one of the most memorable moments of Good Calories, Bad Calories? Lab data about mice is particularly telling. Studies of other societies who contact the Western diet disease. MUSt read! Most of it was great. Nicely read by Chamberlain, but the real brilliance of this book is the quality and depth of the research described in the book. This is probably the best and most important book that I have ever read or listened to. As a scientist, though in a completely different field, i understand very well how this could have happened. Unfortunately, we are all liable to become victims of our egos, and treat our ideas as revelations making us prophets of truth, and anyone who has a different oppinion a heretic. Science is passion, and where there is passion there may also be blindness if we are not watching ourselves and consciously staying open minded. Needles to say, the growing pressure to publish ever more quickly and the focus on the quantity rather than the quality of the science is not conducive to open minded inquiery. I am saddened to see the situation is the same in medical science. I have been looking for a review of the dietary science behind healthy diet guidelines as i could not reconcile some of my own observations on my path to a healthy life with the accepted dogma. This book is providing a great review of the literature and clarified the situation a great deal. Now i understand why the dogma doesn't work, and where my reactions come from. I have suspected for some time that i was addicted to sugar and had noticed eating carbs tended to keep me hungry. Now if i could just as easily become a meat eater as it was understanding why carbs are fattening it would be great! I've spent most of my life eating meat more as a side dish, and never found it particularly paletable, especially when it comes to red meet, like beef or lamb. That's not likely to make curbing my carb addiction easy, but i'll live with it.